Zachary Quinto and the team at Petsami, a YouTube channel targeted towards animal lovers, have released a cute animal adoption film on YouTube. The film is titled Dog Eat Dog, and it follows Zachary Quinto as he attempts to adopt a dog. Watch Quinto try to get his favorite dog in this adorable short film after the jump. 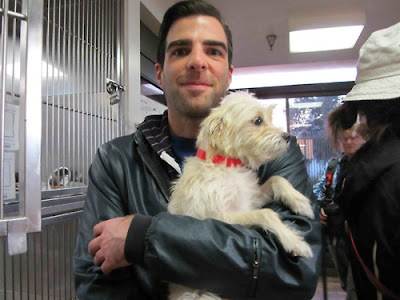 “Dog Eat Dog” is a short film based on the true story of how actor/producer Zachary Quinto finally adopted his first dog in a Los Angeles Animal Shelter. During the events of his hilarious trials in attempting to adopt a shelter animal, Sian Heder, the film’s director was there by his side. Taking notes. Preparing a great dinner party story. And that story, told on countless occasions, eventually evolved into the script. “Dog Eat Dog” is a twisted, fun, morality tale about the lengths to which some of us will go in order to get what we want.